Blackburn Rovers FC has announced a unique charity of the year partnership with The Prince’s Trust for the upcoming 2011-12 football season. The partnership will see Rovers donate the branding space on its famous shirts to the charity instead of selling the space to a sponsor. The club, which has a history of running Prince’s Trust programmes for disadvantaged young people in the area, has committed to fundraising for the charity throughout the season in addition to the pro bono shirt contribution. 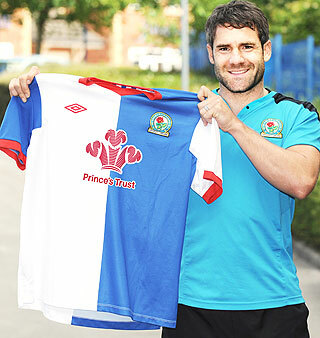 Rovers decided to reject some commercial sponsorship offers in order to grasp the special partnership opportunity. It would have been interesting to know how much they could have sold the sponsorship for? Last year the BBC reported that clubs like Utd and Liverpool were making 20million a year from shirt sponsorships, with clubs at the lower end of the premiership earning between 0.5 -1 million. The article states that “Shirt sponsorship typically makes up between 2% and 10% of total club revenues, industry figures suggest”. So this is a sizeable investment/donation by the club. Anyone got any other examples of clubs (in other sports) that have done this? Thanks to Mark Barkaway for the tweet. This is really really interesting research by Aradhna Krishna. So many organisations (corporate and charities) want to engage in Cause Marketing. We are all told how it boosts sales, 76% of consumers are more likely to buy if the brand is associated to a cause etc..etc.. But perhaps its the wrong model? Are companies making real donations, or in kind, and what is the knock on effect of this new research? I don’t have the answer, but this is certainly food for thought for people in all sectors. I expect we will hear a lot more about this. Results from a pilot field study and two laboratory studies show that consumers’ direct charitable giving to a charity is lower if they purchase on CM (cause marketing) even if the cause marketing purchase is costless to the consumer (unlike other forms of charitable giving). This suggests that even if CM purchases are costless, consumers think of their purchase as a charitable act and decrease subsequent charitable acts. This is corroborated by the fact that in both laboratory studies, the higher the cause marketing expenditure, the lower the individual charitable giving, indicating that people may mentally assign their CM expenditure as their charitable giving. Consumers may even think of the firm’s donation as theirs since it is facilitated by their act — in fact, this type of thinking is “rational” since it allows consumers to spend less to meet their donation goals. The premise that cause marketing will always increases total money raised for the cause is shown not to hold in our studies. We find that instead of increasing total contribution to the cause, the presence of CM can decrease it. It needs to be noted, that whether total donation increases or decreases with CM depends on firm contribution. We have merely challenged the belief that total donation always benefits with CM, with the objective of making consumers and public policy officials think a little before embracing CM at every opportunity. This is especially important given the number of highly opaque CM campaigns that are run – for instance, many do not report what portion of proceeds are given to the cause, some have limits on their donation and keep the excess monies raised (e.g., the notorious Yoplait campaign – see Boston Globe, October 4, 2009), some report the donation as a part of unreported profits. CM purchasing substituting for charitable giving is also consistent with people choosing the less costly altruistic option. However, the laboratory studies show that the less 18 empathetic altruism option of CM purchase chosen by consumers leads to lower contentment. It is as if people know intrinsically when they have done selfless charitable acts. The egoistic nature of cause marketing purchases is evidenced in open-ended responses focused on selfutility, or selfish reasons. It is also seen as being more selfish and less empathetic in thirdparty ratings of “purchasing and donating behavior” as being more caring, helpful and sacrificing. Our results are in line with work showing happiness to be a function of donation amount. However, our research adds another dimension to research linking charitable giving and happiness — selfish versus selfless altruism can have different effects on happiness. You can hardly not notice that October is Breast Cancer Awareness month. No other cause has been able to do what the Breast Cancer charities have been able to do and brand a month and own a colour. I love it. For the first time ever though this year I have seen some articles from people warning about a Pink Backlash, or potential backlash. There seems to be some concern over how genuine the partnerships are in some instances and how much of the profit goes to the cause, while the company gets to highlight its pink credentials to its core market. Its an interesting debate and all I would say to charities is dont undervalue your own brand, you can say No to a partnership if it isnt right for you. I noticed the Target Facebook campaign where they asked their customers (and others) to vote for a charity from a list of ten. Each of the ten would recieve a share of the 3 million dollar pot (Beth Kanter has some more info on it here). Its kind of Kiva like in its approach isnt it. Charity Navigator have posted on their blog about another company doing something similar. Tom’s of Maine is offering five $20,000 donations to support community projects in a contest called 50 States for Good. Charity Navigator sees this as a continuing of the trend of for profits allowing their stakeholders have a say in where their donations go. We have seen this here to a degree with companies short listing charities for a charity of the year and asking employees to vote for their “favourite”. Pairing philanthropic work with customer involvement is a natural move for many companies, who typically give back a portion of their earnings to the community. By drawing new visitors to their site with an interactive experience such as voting, they engage their patrons while supporting a good cause. The Tom’s of Maine contest has drawn applications from organizations in nearly every state. One of the issues we often face in talking to companies is how we are going to help them do their business by partnering with them and this seems like it ticks that box. I have certainly seen it lead to charities campaigning and driving people to the site of the company involved. On the down side it probably means the larger organisation will fair better in a National campaign and it may lead to a bit more competition in the market (like there isnt enough!). Some other examples are Waitrose, who do the same thing but very very locally and Smarties in Canada who did Colours for a Cause. So this seems like the trend and the smart charities will embrace this and adapt their approaches to reflect this kind of thinking. How you do that is up to you….maybe you partner with others and approach a corporate, maybe you choose projects that customers can vote to support.